The Shidler Freshman Direct Admit Program (DAP) is designed for high achieving incoming freshmen who wish to enter the UH Shidler College of Business and get a head start on their Business curriculum. Outstanding high school seniors entering UH Mānoa in the fall are invited upon acceptance to the university. Selective admission for the Shidler Freshman Direct Admit Program is highly competitive and based on students' Grade Point Average (GPA) and SAT or ACT scores. On your UH Mānoa application, simply designate "Pre-Business" or any specific business major as your first choice major, and you will automatically be considered for the Shidler DAP. No separate application is necessary. The final deadline for the UH Mānoa application is March 1st. If you would like to provide us with additional information such as a resume, personal statement, or updated test scores, please visit shidler.hawaii.edu/freshman-dap/admissions. DAP students are introduced to the Shidler College of Business curriculum beginning their freshman year. Students are grouped in two business related courses reserved strictly for the DAP cohort of that year. A copy of the four year plan can be found here. 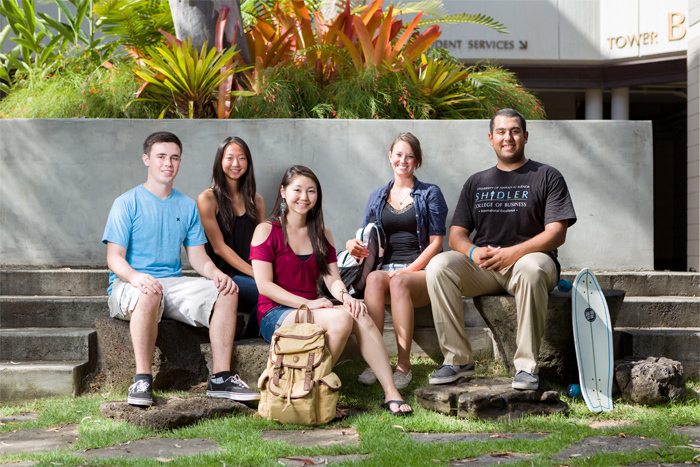 Upon enrollment, Shidler DAP students will be eligible for available scholarships.There are also many UH Mānoa and Shidler College of Business scholarships available through the UH STAR System online at www.star.hawaii.edu/scholarships. The STAR Sytem helps students find scholarships they are eligible for and facilitates the online application process. Applications are due in mid-February of each year. A select number of DAP scholarship are available to students already accepted to the DAP. Visit the DAP scholarship page to apply. Why be a Shidler DAP student? Join student clubs and organizations, such as the American Marketing Association, Accounting Club etc. Western states students: See additional information on why to be a Shidler DAP student. Unable to come in for an on-campus appointment? We now offer phone and Skype appointments! Please call (808) 956-8215 at least 24 hours in advance to schedule an appointment.